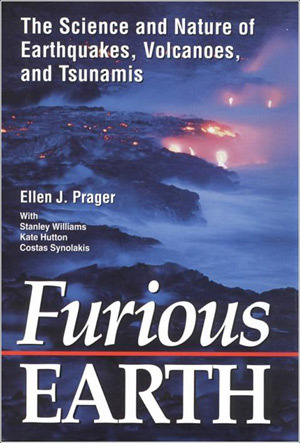 Ellen J. Prager, PhD Earth2Ocean, Inc.
Today, even with advanced technology and an improved understanding of our dynamic planet, we cannot predict earthquakes or tsunamis. Our best bet when combating their potentially tragic consequences therefore is to be as prepared as possible by assessing the dangers, educating those at risk, building as safely as possible, providing warning when and where possible, and continuing to strive for more knowledge and forecast ability. Earthquakes have been occurring on our planet since the dawn of time and as human populations spread and grow, more and more people will feel the impact when the ground shakes. And whenever such events occur, no matter what field of science or education you are in, you may be called upon to answer some of the most frequently asked questions about earthquakes and/or tsunamis. Here are answers to some of those questions and an overview of the earthquake and tsunami that tragically struck in the Indian Ocean on December 26, 2004. Across the globe earthquakes are happening all the time, most of them are too small to feel and others occur in remote regions. You may be surprised to learn that there are 2 to 3 earthquakes of a magnitude 6.5 or greater somewhere on the planet each week. If we look at the distribution of earthquakes on the planet we see a very distinct pattern for the most part. The locations of the earthquakes outline the tectonic plates that make up the Earth’s surface. 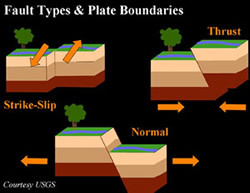 Thrust faults occur where tectonic plates move toward one another and one plate is thrust up and over the other. The most violent and destructive earthquakes tend to occur in association with thrust faults and these occur most commonly in subduction zones; where one plate is “subducted” beneath the other. 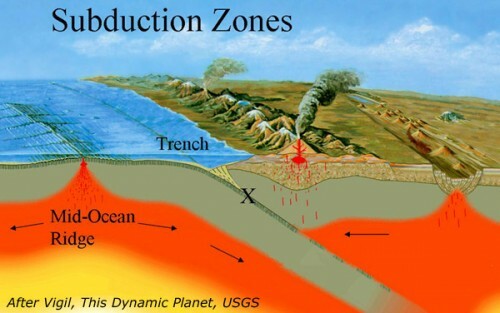 The surface expression of a subduction zone is a deep-sea trench. So when you look at a chart of the seafloor and see a deep-sea trench, it is your clue that it is also the site of a subduction zone and an active earthquake region. There may also be volcanoes lying behind a subduction zone, such is the case in the Pacific Northwest behind the Cascadia Subduction Zone. The Pacific Northwest lies within a tectonic region known as the “Pacific Ring of Fire”. 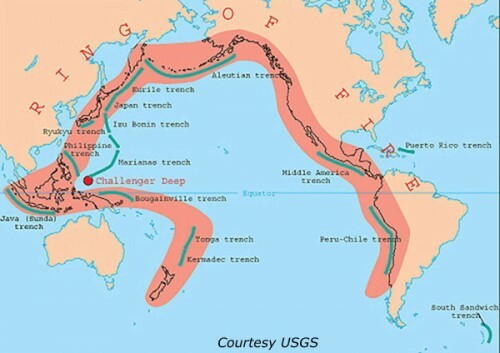 Subduction zones and deep-sea trenches line the northern border of the Pacific plate, thus the “Ring of Fire” is one of the most tectonically active areas in the world in terms of earthquakes, volcanic eruptions, and tsunamis. 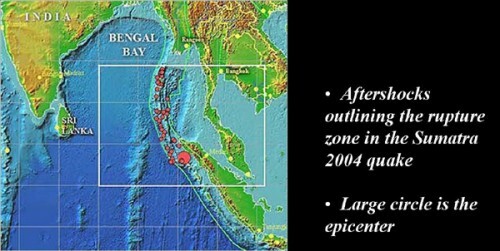 Looking at a map of the Ring of Fire, we are now all too well aware of a small western offshoot into the Indian Ocean, where a deep-sea trench and underlying subduction zone lay to the south of Sumatra and generated the 2004 tragedy. What state in the U.S. has the most earthquakes? Bet you thought the answer was California. 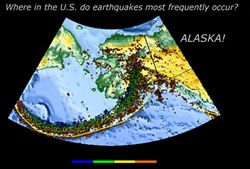 It’s Alaska and the reason, just to its south lays the Aleutian Trench…aka a subduction zone. As the Earth’s tectonic plates move, they don’t slip smoothly past or over one another. Friction causes the plates to stick, but they keep trying to move. So over time strain builds up, until at some point it becomes too much and the rocks break or slip past one another. 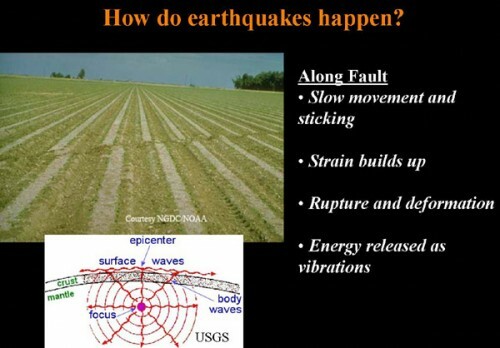 All of the energy built up as strain over time is released into the surrounding earth as vibrations or seismic waves. This is an earthquake. The break begins at a specific site, the hypocenter (underground) or epicenter (at the surface), and then ruptures along a fault. The magnitude of an earthquake reflects how much the earth shifts and thus the amplitude of the seismic waves that are generated. Sometimes, like the case in the 2004 Sumatran quake, the reported magnitude will change as more reports come in. That’s because as more information is received from an increasing number of seismic stations the actual magnitude of a quake can be better determined. Most scientists now simply use the term magnitude rather than “on the Richter Scale”. The Richter scale was developed in the 1930’s based on a specific type of seismometer located 100 km from the epicenter of a quake. Today’s instruments are more advanced and can measure the amplitude of a number of different types of seismic waves, so it is more appropriate just to say “with a magnitude of” rather than “on the Richter Scale”. That said; we still use the same format as the Richter scale in that it is logarithmic, with a magnitude 4 being ten times greater than a magnitude 3 in terms of shaking. With regard to energy release, each level of magnitude is 32 times greater in terms of its energy. What determines the impact of an earthquake? The impact of an earthquake depends on a number of factors, including its magnitude, where it occurs, the population density of the region, the type of construction present, the geology of the surface and underground. 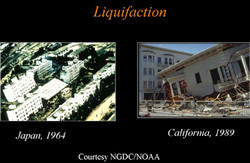 In areas where buildings are constructed on fill, loose debris or sand, a phenomenon known as liquifaction may occur during an earthquake. Liquifaction causes the ground to behave fluid-like and structures may sink and/or collapse. In the pricey marina district during the 1989 Loma Prieta earthquake in California buildings collapsed due to liquifaction. It later came to light that the structures had been built on debris from the great 1906 quake. Large aftershocks tend to occur sooner rather than later. 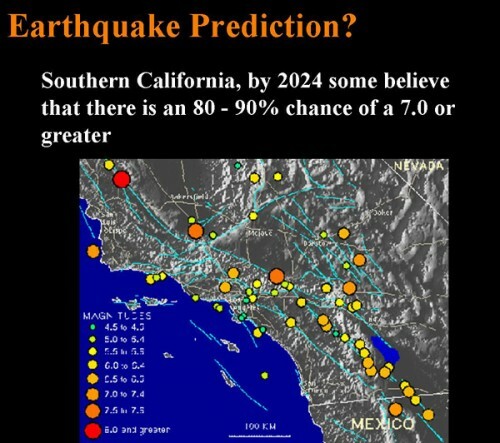 That doesn’t mean that a large one won’t happen sometime after the main quake, it is just less likely than at first. Aftershocks decrease with time, can trigger activity on other faults, and their distribution delineates the rupture zone along a fault. Some scientists believe that earthquakes are inherently unpredictable! Today, researchers are trying to assess the strain or stress being built up on faults to predict the probability of a certain size quake over a given time period. But prediction has, so far, remained an elusive art when it comes to earthquakes. Are there reliable precursors of earthquakes? In 1975 in Haicheng China, a quake was predicted based on changes in groundwater, hundreds of foreshocks, and strange animal behavior. Many people were evacuated just before a 7.3 magnitude quake occurred. However, a year later a 7.2 magnitude shook Tangshan without warning and killed over 240,000 people. Throughout history anecdotal evidence has told of strange animal behavior and other precursors just before an earthquake has struck. Unfortunately, none have yet proven reliable. For animals, there are so many outside stimuli that discriminating one strange behavior from another just doesn’t work. Foreshocks may tell of a coming larger quake, but there is no way to differentiate a foreshock from a mainshock or to determine what is coming next. Scientists are currently investigating an infrared signal detected by satellite instrumentation prior to a few quakes to see if it could be a reliable precursor. Without the ability to predict quakes, the wisest thing we can do is to better assess risk and be prepared as possible. 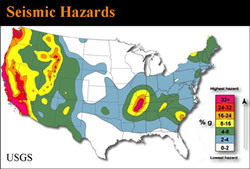 Along this line, the U.S. Geological Survey is now producing seismic hazard maps and other products that can help ( www.usgs.gov ). Researchers continue to ply the planet’s interior workings to learn more about earthquakes and the risks involved. 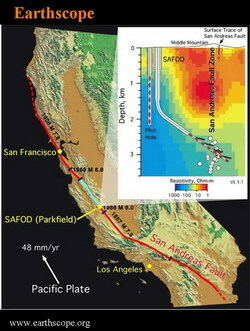 Two things to keep an eye on; one is called Earthscope, a project that includes drilling into the infamous San Andres Fault and deploying a dense seismic network across the nation ( www.earthscope.org ). Another area of new investigation is occurring in Japan, Taiwan, and Mexico where automatic warning systems are being established in which the several second lag time between arriving p-waves and s-waves (what we feel as shaking) can be used to shut down trains, close gas valves, and notify emergency response personnel. 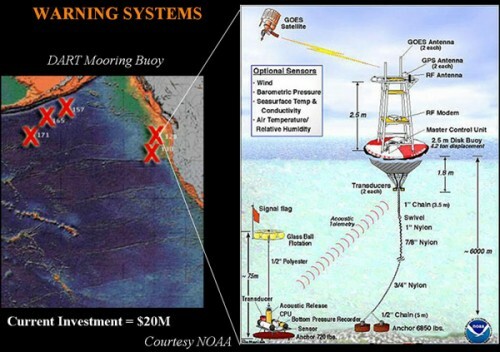 The idea is controversial in that some people believe that the several second warning is not worth the millions it will cost and that it may divert much-needed resources for preparedness. While the tragic events of December 2004 brought tsunamis into the spotlight, they have been occurring on the Earth for as long as its surface has been constructed of shifting tectonic plates and much of it is overlain by seawater. 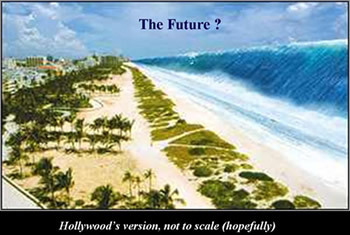 The question really is not if, but when the next tsunami will strike and where. Over the past decade there have been about a dozen significant and deadly tsunamis, though because they occurred in relatively remote regions they have gone somewhat unnoticed. And they have not been of the magnitude of the 2004 event. For instance, you might be surprised to learn that in 1998 in Papua New Guinea a powerful undersea earthquake and landslide generated a tsunami that wiped out coastal villages and killed more than 10,000 people. Just say no to the term “tidal wave”!! Tsunamis are seismic sea waves, having nothing to do with the tides. They are one or a series of waves generated by a sudden movement or disturbance of the seafloor by an earthquake, volcanic eruption, landslide or an asteroid impact. Over the last decade or so, researchers have discovered that many tsunamis are not triggered by the earthquake itself, but by quake-generated underwater landslides. 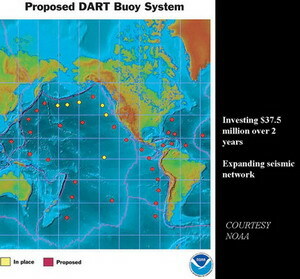 Imagine the seafloor pushed up or pulled down, directly above it the water follows suit. A mound or trough of water is unstable and thus gravity causes the water to move towards a level surface…thus starting the propagation of a wave. Take a cup of water and blow over the surface; a thin layer of water is dragged along. If you now shake the cup, all of the water moves, sloshing over the side. 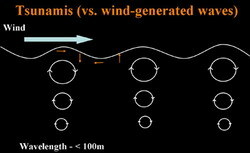 Wind waves occur as wind drags the ocean’s surface, transferring energy into and through the water. Within the water, energy is transferred by orbital motions that make the water appear to travel as a wave. On the other hand, tsunamis are waves created as energy is transferred into the entire water column, all the way from the seafloor to the surface. They tend to have wavelengths that are hundreds of kilometers long and travel in the open ocean at the speed of a jet airplane, some 500 to 700 mph. In the open ocean, they are nearly imperceptible, traveling as very low, long, fast waves. If you were in a boat on the open ocean, you wouldn’t even notice it if a tsunami passed beneath you. 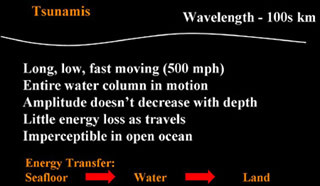 There is also little energy loss as the wave propagates through the sea. Think of the energy released during an earthquake under the seafloor. It is transferred from the subsurface into the water and then moves landward. And guess where that energy is finally dissipated – you got it, on land as the tsunami strikes the shore. Its energy is released as a destructive force. In the case of the Sumatran quake, it has been estimated that the energy released was equivalent to that of 32 billion tons of TNT. What happens at the shore? As a tsunami approaches the coast, the water depth decreases. Shallowing and friction from the bottom causes the front of the wave to slow down. As the back end of the wave continues speeding toward shore, while the front is slowing, the wave starts to bunch up and steepen. Due to this slowing tsunamis typically strike the land at approximately 30 mph. While earthquake generated tsunamis are, in general, not much greater than 10 m (30 ft) in height, landslide triggered waves can be monstrous. In Lituya Bay, Alaska in 1958, a landslide triggered a wave estimated to have reached a towering 450 m (1500 ft) in height. 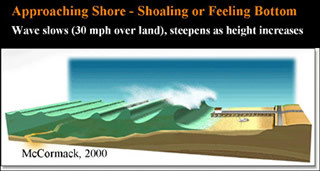 The configuration of the shoreline, direction of approach, bathymetry, size of the triggering event, and the habitats along the coast all control how the wave strikes the shore – as a towering wave or powerful surge of water. For instance, a healthy coral reef offshore may cause the wave to break further away from the coast and mangroves or coastal forests can act to dampen the energy as the water rushes ashore. It is normal to have variability along the coast in how the tsunami looks and behaves as it strikes. Are there precursors or warning signs of a tsunami? If nothing else this is clearly one of the most important things you can teach your students and others about tsunamis. The experts believe there are potentially three warning signs of an approaching tsunami. A rapid retreat of the sea. If it looks like an extremely fast, low tide is occurring, go inland and go high as quickly as possible, do not go out to the shore to investigate. The shaking of the ground. If you are at the shore and you feel the ground shake, an earthquake, it may have begun offshore and has the potential to trigger a tsunami, so go inland and go high as quickly as possible. A loud bang or rushing freight train sound. If you are at the shore and hear either of these coming from offshore, go inland and go high, fast. Scientists are not sure why these sounds occur, but they have repeatedly been reported just before a tsunami hits. 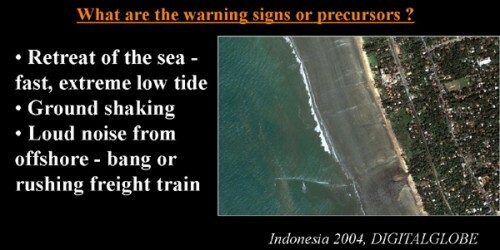 These warning signs may happen minutes or hours before a tsunami strikes. And tsunamis can often be more than just one wave, so if one does hit, continue to stay in or seek shelter until hopefully you’re notified that it is safe by emergency personnel. December 26, 2004 south of Sumatra. 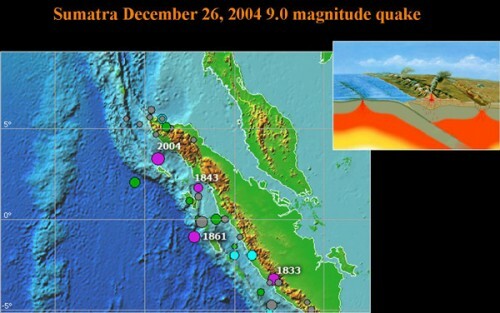 A 9.0 magnitude (some now estimate that it was actually 9.3) occurred about 250 km south of the island of Sumatra at a depth of about 30 km on December 26, 2004. The quake triggered a catastrophic tsunami that devastated the coastal communities in its path and has been blamed for some 300,000 deaths. 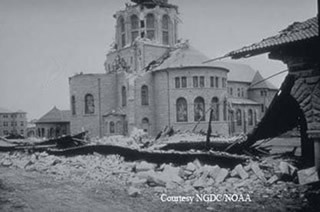 It was not the first time a quake had generated a deadly tsunami in the region, with several having occurred in the 1800s. However, the magnitude of this event and its destruction were unlike anything seen in recent history. The region’s setting is one of a subduction zone and the quake caused a rupture that has been estimated at over 1000 km long. After the initial earthquake occurred, it is believed that the rupture grew to the north-northwest and is one of the reasons the most powerful waves were directed in a similar direction. 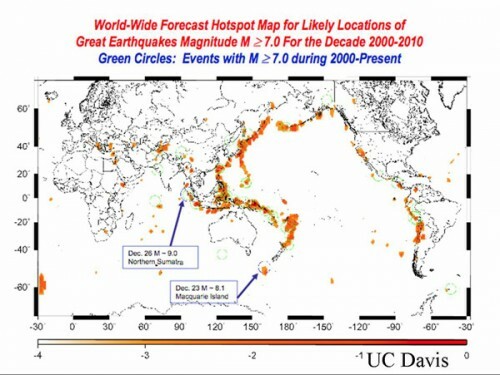 Eric Geist of the USGS produced a computer simulation (below – 20 seconds long) of the event. 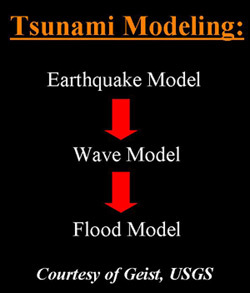 Tsunami modeling is a complicated and difficult task. It requires the combining of an earthquake model with a wave model with a flood model. The infrequency, suddenness, and scale of tsunamis makes them difficult to study and input data for models must often be estimated or collected in the field after an event. Dr. Vasily Titov of NOAA’s Pacific Marine Environmental Laboratory produced this display of the arrival time of the tsunami waves generated by the earthquake. Along the northwest shores of Sumatra the waves struck within minutes, possibly on the order of fifteen. In Sri Lanka there appears to have been about a two-hour time period between generation and when the waves struck. Purely by coincidence, approximately two hours after the massive earthquake, a US/French satellite equipped with a sea surface altimeter passed over the region. Estimates from space confirm that the tsunamis traveled as low waves in the open ocean, on the order of 40 and 50 cm high (1 to 2 feet). 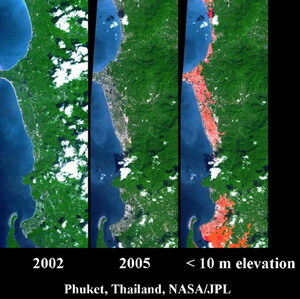 Other images (two below) from space reveal the before and after, showing the magnitude of the destruction and a ravaged landscape. Post event surveys have begun, both on land and underwater. This type of field work is essential to scientists trying to better understand, model, and warn of tsunami dangers. 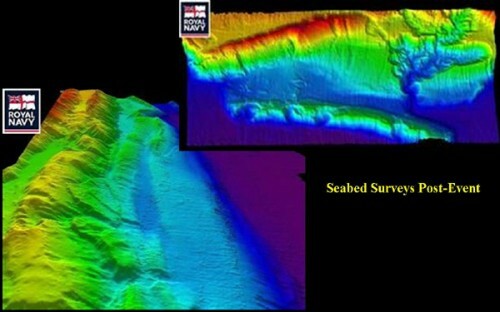 The British Royal Navy released these pictures (above) of the seabed post-quake. Caution should be taken when interpreting such images without pre-event data for comparison. When baseline data is unavailable, as is often the case, it is difficult to determine change due to a specific event. Satellite imagery can help to assess damage and to plan for safe rebuilding. Post-tsunami imagery reveals that in many areas, land surfaces with an elevation below 10 meters were the hardest hit. Teams from USC and the USGS along with other experts have gone to the areas impacted by the December tsunami to do post-event surveys. 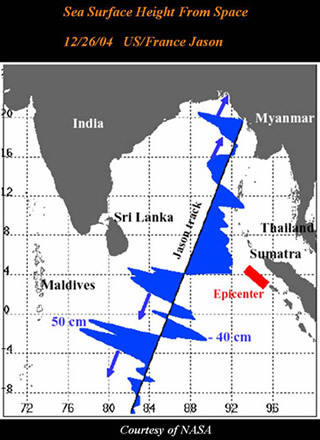 Some of the initial data suggests that in Sri Lanka the vertical run-up at the coast (vertical height of the water from sea level) was between less than 3 meters to over 12 meters. In one area, a v-shaped valley appears to have focused the wave, magnifying its amplitude and causing a run-up of over 30 meters. Reports from the region also suggest that the inundation distance (horizontal distance the wave traveled inland) varied from about 50 m to about 1 km. 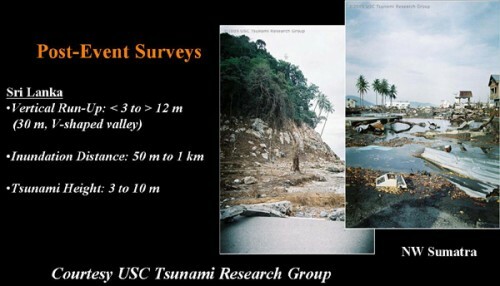 And evidence at the scene suggests that the tsunami was 3 to 10 m in height depending on location. What are tsunami warning systems and how do they work?? Tsunami warning systems have several components: technology and technical staff, emergency response infrastructure and communications, and education. If a tsunami occurs locally, a warning system may be of limited value and knowing the signs of an approaching tsunami and how to respond may be the most critical. If a tsunami is triggered at some distance, then an effective and working warning system can save lives. At the shore tide gauges are also used to confirm whether a tsunami has been generated. Adequate emergency communications infrastructure and personnel are required to act quickly and to widely disseminate any warning. Education is also critical so that people respond in an appropriate and safe manner. Unfortunately, neither the technology, the emergency response infrastructure, or the education were in place in and around the Indian Ocean as of December 26, 2004 and the results have been horrific. 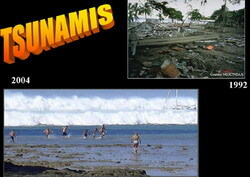 Earthquake triggered tsunamis have also occurred in the Caribbean. 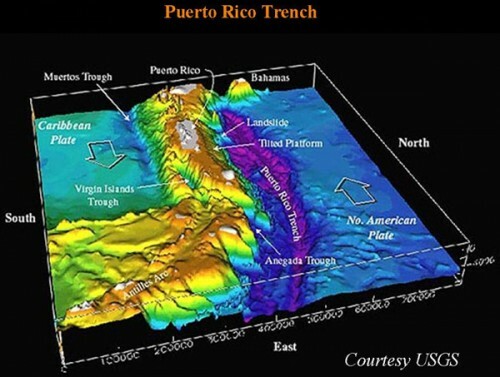 The Puerto Rico trench is evidence of the underlying subduction zone. In the past, tsunamis have caused fatalities in Puerto Rico as well as the U.S. Virgin Islands. With the huge increases in population in the area and tourism, if a tsunami were to strike now or in the future, the devastation would be much worse. There has also been a landslide generated tsunami in Newfoundland, an earthquake triggered one in Lisbon, and one scientist predicts that if a volcano in the Canary Islands were to erupt it could generate a huge landslide and trigger a tsunami that would impact the U.S. east coast. Tsunamis are much more likely to occur in the Pacific Ocean than in other areas, that doesn’t mean they cannot happen elsewhere.The best thing we as a nation and as citizens of the world can do is to understand tsunamis as well as possible, assess regions at risk, improve our ability to warn populations when possible, and educate people about the warning signs and what to do. And it is not just for those who live in tsunami prone regions, for as we saw in December, many of the people killed were tourists.